On Saturday(April 7th) Maddie Ziegler and Constance Zimmer hit the red carpet at the For My Friend's Place 30th Anniversary Gala at the Hollywood Palladium in LA. 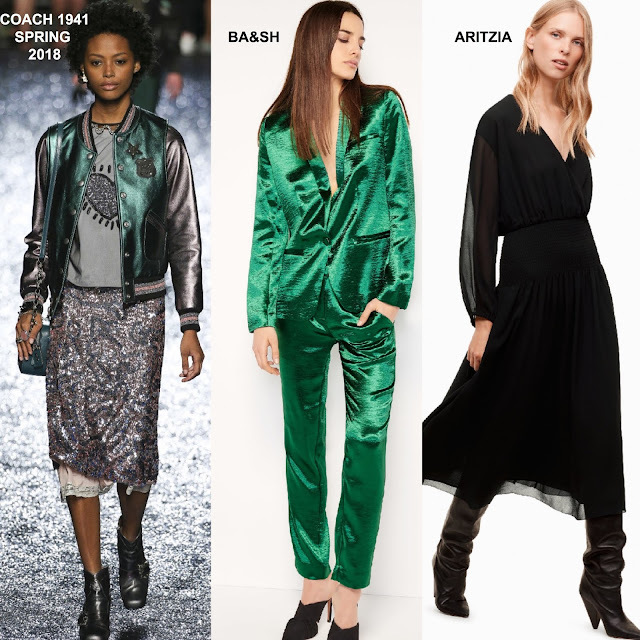 Maddie Ziegler ditched wearing a dress for the green BA&SH 'Carina' notch lapel, shimmery metallic jacket with the matching 'Concert' pants and a grey sequin heart COACH 1941 SPRING 2018 tee shirt underneath. Keeping the styling simple, she topped off her great look with smokey eyes and NICHOLAS KIRKWOOD sandals. Constance Zimmer wore the ARITZIA 'Valros' sheer black long sleeve wrap dress which was accessorized with SONIA BOYAJIAN earrings and a playful CLARE VIVIER envelope clutch. I actually prefer how the dress was styled in the look book with the boots but Constance black studded heels worked as well.